The GyroStim is a computer-controlled multi-axis rotating chair that can safely and comfortably rotate a person in the pitch axis (somersaults), the yaw axis (office chair spins), or both axes at the same time. Its advanced technology and innovative brain training applications can improve balance and brain performance regardless of your current brain health: from extremely dysfunctional to extremely high functioning, or, like most of us, somewhere in between. Have you ever wondered how to improve your reaction time? 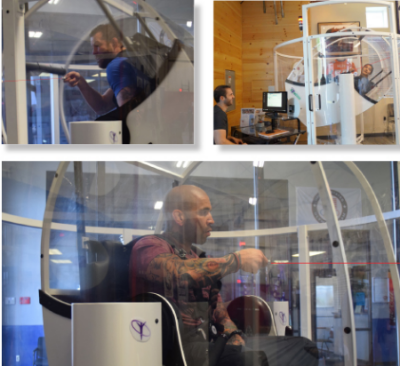 GyroStim immerses you in a dynamic brain training environment that presents repetitious cognitive and physical challenges that help synchronize and improve your brain’s processing and reaction time skills. The GyroStim rotates you through space while surrounded by multiple laser targets. Your goal is to use a laser to hit as many of the laser targets as possible as they come into and leave your field of vision while you are in motion. As your ability to hit more targets improves, you’ll be presented with more challenging levels of motion intensity. At the same time, you may also be challenged to engage in cognitive and memory exercises to further condition and train your brain. All of these brain training strategies combine to improve interaction between different functional regions within the brain. Brain training with GyroStim simultaneously reinforces three fundamental cognitive processes required for optimal human performance: PERCEIVE • PROCESS • REACT. For people seeking to recover from concussion, traumatic brain injury, or a multitude of other neurological conditions, GyroStim can provide powerful vestibular therapy to address persistent symptoms and restore lost function. For healthy individuals wanting to think more clearly, make better decisions, and perform at their best, GyroStim improves brain processing skills for better performance at work, in sports, or in life. To learn more about GyroStim, visit GyroStim.com.